This sausage risoni is quick to make and quicker to clean up – it only uses one pot. Heat oil in a saucepan over medium heat. Add the chorizo, onion and eggplant and cook, stirring, for 10 minutes or until the eggplant is soft. Add the wine and bring to boil, scraping with a flat-edged wooden spoon to dislodge any bits that have cooked onto the base of the pan. Stir in the risoni, tomato and stock. Season with salt and pepper and cook, stirring often, for 10-12 minutes or until the risoni is al dente and most of the liquid is absorbed. Add the spinach to the risoni mixture and stir until well combined. Divide among serving bowls. Sprinkle with the parmesan. Season with pepper to serve. Omit eggplant, spinach and parmesan. 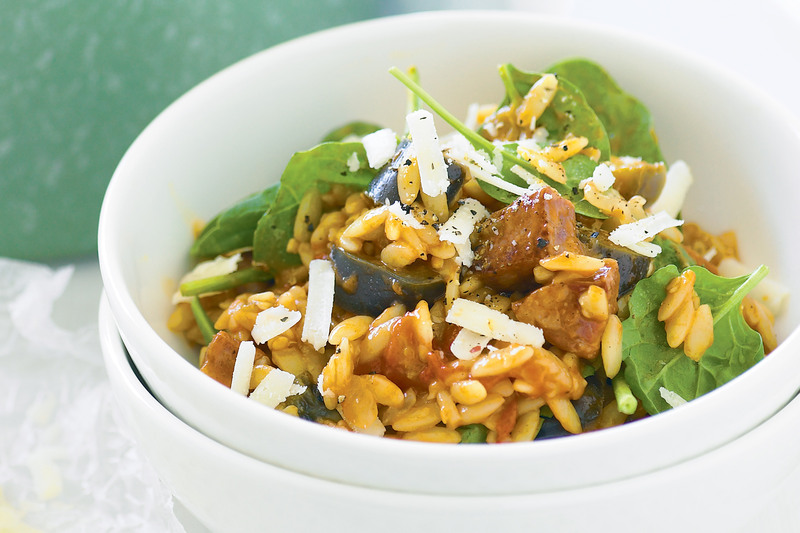 Replace the risoni with 300g (1 1/2 cups) long-grain rice. Heat a non-stick frying pan over medium-high heat. Add 2 (about 400g) single chicken breast fillets, thinly sliced, to the pan and cook, stirring, for 2-3 minutes or until browned. Add 1 tbs Cajun spice mix to rice mixture with the tomato in step 2. In step 3, add chicken and 12 peeled cooked prawns to the rice mixture, and stir until heated through. Serve. Omit the spinach. Reduce the risoni to 105g (1/2 cup). Increase the stock to 1.25L (5 cups). Add 2 zucchini, finely chopped, to the risoni mixture at the end of step 2 and cook, stirring, until zucchini softens. Serve with crusty bread. Omit the risoni and stock. Replace the chorizo with 200g diced bacon. Replace the eggplant with 200g sliced button mushrooms. Cook 375g dried rigatoni pasta in a saucepan of salted boiling water following packet directions or until al dente. Drain. Add to tomato mixture with the spinach in step 3. Serve.